Climate change is bringing both incremental changes and more frequent extreme events, both of which could have major impacts on ancient and veteran trees. At the same time, the resilience of ancient trees could provide some protection from the impacts of climate change. For example the size of the crown often decreases as trees become ancient,and the diameter of their trunks increases in relation to their height, so they are less likely to be blown over by gales. In times of flood, the species of tree species might be more important than its age (some species such as willows are able to withstand waterlogging longer than others). 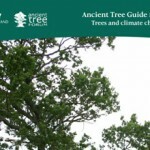 This guide is for anyone with a responsibility for, or interest in, ancient trees, including owners and land managers, tree officers, arboriculturists and foresters.